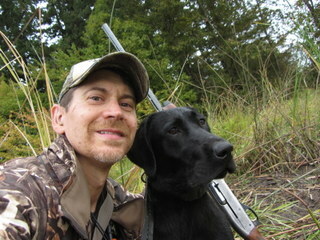 For the past several months, I’ve had the pleasure of bird hunting with Ruby, my 18-month-old black lab. This was her first hunting season and it was tons of fun for both of us. I absolutely love bird hunting as a team with a dog. It’s a special bond between two hunters and every day in the field together is enjoyable, whether we bag any birds or not. 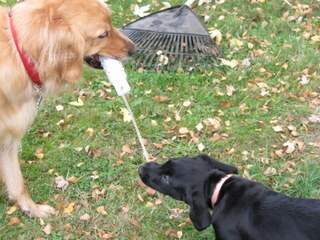 We started training together as soon as Ruby came home at seven weeks, first retrieving a ball in the house, then rubber bumpers in the yard (sometimes in competition with her big brother, Banjo), and then moving on to retrieving both dead and live birds on land and in water. 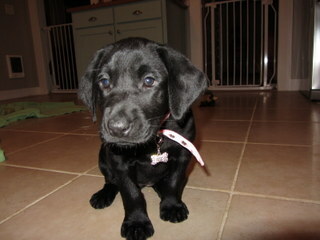 Ruby was gung-ho from the beginning, thanks to her prime genetics for hunting and field trial work. By October, Ruby was ready for the opening day of duck season. Soon after, we hunted geese, and then jumped into upland bird hunting, chasing pheasant, quail, Hungarian partridge, and chukar. Thanks to my hunting buddy, Brandon, and his trusty English Pointer, Bella, Ruby was able to tag along and learn how to hunt those elusive upland birds. It was a great experience for me to watch Ruby’s skills progress from one hunt to the next. I will never forget the day when “the light bulb came on” and she knew how to hunt on her own from that moment forward. We have been eating well ever since! It takes a lot of work to get a puppy ready for her first hunting season, and I owe a debt of gratitude to James MacDonald of Wetland Retrievers for guiding us through a year of waterfowl training and Brandon Arn for getting us on upland birds early and often. Ruby is now honing her skills with Robin Rawls, owner of Wetland Retrievers, and I can’t wait to get back out in the field with her again soon. Click here for more photos from our first hunting season together. 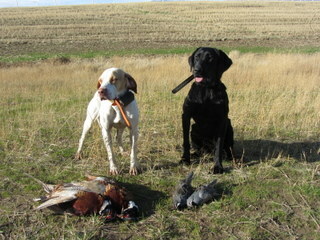 This entry was posted in Bird Hunting, Duck Hunting, Gun Dog, Hunting, Upland Hunting. Bookmark the permalink. ← I Have Elk Fever! Right on, Matt! Get the smoker fired up! Mr. Matt, now you’re going to have to change your “About goathunter” to include BOTH Banjo and Ruby!